LEXINGTON, Ky. (April 2019) – American Field (AF), a curated marketplace for the most innovative and emerging brands in the nation, is heading to Kentucky to set up a curated marketplace of 21 brands at the famous Keeneland Race Course and at the Maker’s Mark Distillery on April 12thand 13th respectively. By spotlighting authentic and high-quality products, the AF event gives shoppers the ability to connect directly with entrepreneurs who’ve built brands in fashion, food, and lifestyle. Since 2012 AF has been on a mission to transform the retail experience and is thrilled to have the opportunity to partner with two iconic Kentucky brands for our first markets in the Commonwealth of Kentucky. The curated selection of brands will be travelling from as far as Boston, MA and Sea Island, GA, to everywhere in between, and will offer products including minimalist women’s jewelry, Made in USA menswear, outdoor grills, and craft cocktail mixers. Friday, April 12thwill be held at The Hill at Keeneland Race Course – 11am – 6pm. 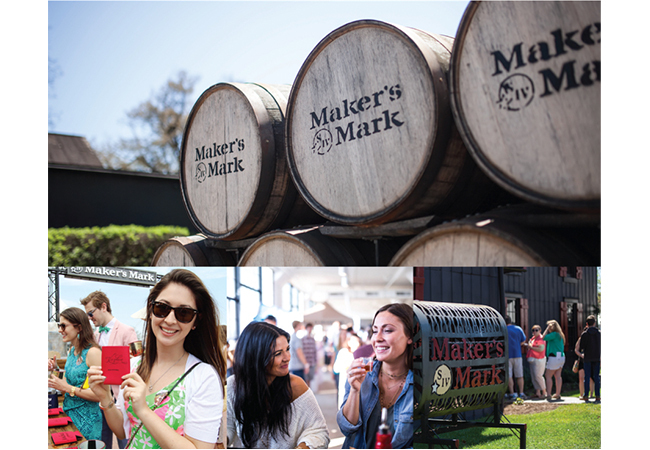 Saturday, April 13thwill be held on the Maker’s Mark Distillery grounds – 10am – 4pm. In 1954, in Loretto, Kentucky, Bill Samuels, Sr. fulfilled his dream to create a handmade and delicious bourbon. He decided to make his whisky in small batches, using soft red winter wheat, with a proprietary barrel char to enhance the softness and sweetness. He then rotated each barrel by hand for consistency, and finally, aged each barrel to taste. Bill Samuels, Sr. transformed bourbon from a “commodity” into a premium handmade spirit, and today Maker’s Mark® continues to make its bourbon exactly the same way. In recent years, Maker’s Mark has introduced thoughtful, super-premium innovations to its portfolio including Maker’s 46®, Maker’s Mark® Cask Strength and Maker’s Mark Private Select™, the brand’s first-ever custom barrel program. In 1980, the Maker’s Mark distillery became the first distillery in America to be designated a National Historic Landmark and has also been decreed as the "world’s oldest operating bourbon whisky distillery” by Guinness World Records. It remains one of the Commonwealth of Kentucky’s most popular tourist destinations, attracting hundreds of thousands of visitors annually. For more information, please visit www.makersmark.com. For more than 80 years, the Keeneland Association has devoted itself to the health and vibrancy of the Thoroughbred industry. The world’s largest Thoroughbred auction house, Keeneland conducts four sales a year, in January, April, September and November, and its sales graduates dominate racing globally at every level. In April and October, Keeneland offers some of the highest caliber and richest Thoroughbred racing in the world. Keeneland hosted the Breeders’ Cup World Championships in 2015 and will hold the event again in 2020. Uniquely structured, Keeneland is a private, for-profit corporation that returns its earnings to the industry and the community in the form of higher purses and millions of dollars donated in support of horse industry initiatives and charitable contributions for education, research and health and human services throughout Central Kentucky. To learn more, visit www.Keeneland.com.